Edit photoshop files for free online with this unreal online photoshop tool. In this post we’re going to cover two amazing online photoshop alternatives, which offer all the essential functionality of photoshop with the same features and toolsets ABSOLUTELY FREE. Now just so there is no confusion: Neither of these free tools are by adobe, nor are they exact copies of photoshop. Unlike other free photoshop alternatives, both these tools work EXACTLY the same as photoshop! The tools are the same, the functions are the same, and the layout is the same. For anyone who already knows and uses photoshop, you’ll have no problem finding your way around. They can both open and edit photoshop files like a breeze, autoload fonts, support custom font options and work the same way as the adobe photoshop you know and love. In fact, after using and testing these 100% free online photoshop tools, I’m a little amazed. Imagine having the full version of photoshop on your ipad – Done. Imagine using adobe photoshop on your iphone – Check & mate. Love it or hate it, adobe photoshop is the golden standard of photo editing, and there are certain things you just can’t do without it. As a bonus not offered in Photoshop, Photopea has just updated their web app to include starter design templates. This is a huge time saver if you’re just getting started in the photoshop design world! Both of these free online photoshop file editors are unbelievable. After paying hundreds for a subscription to Adobe Photoshop CC over the years, its hard to believe that not only one but TWO creators are offering an online photoshop editor. I tested both Photopea and PhotoEditOnline as photoshop alternatives, and was impressed with the results. I started by opening up a large photoshop file with several hundred layers, just to see how these online photoshop tools would handle it. One really nice surprise with both of these free photoshop editors was they both automatically loaded 90% of the non-stock fonts when I opened the application. WOAH. That saved me 5-10 mins I would have normally taken to manually find, download and add those fonts into the normal photoshop! The project took 5 seconds to load on Photopea, and about 6.5 seconds on OnlinePhotoEdit. Using photoshop on my computer, the same psd file took about 4 seconds to load. From here the photoshop files edit, save and export exactly the way you’re used to in photoshop. Its really quite amazing. When making edits you start to notice the big differences in performance between photoshop and these online photoshop photo editors. There is a distinct lag when waiting for changes to take affect. I don’t know if this is the app, or possibly simply because of the speed (or lack thereof) of my internet connection, but its definitely there. Overall the programs are still very useable – You just can’t expect the same punchiness in performance from an online application as from photoshop on your computer. For simple edits like text editing, changing fonts, moving and aligning layers etc, both photopea and onlinephototool perform extremely well. For more in depth edits / filters, you simply have to wait for changes to load. 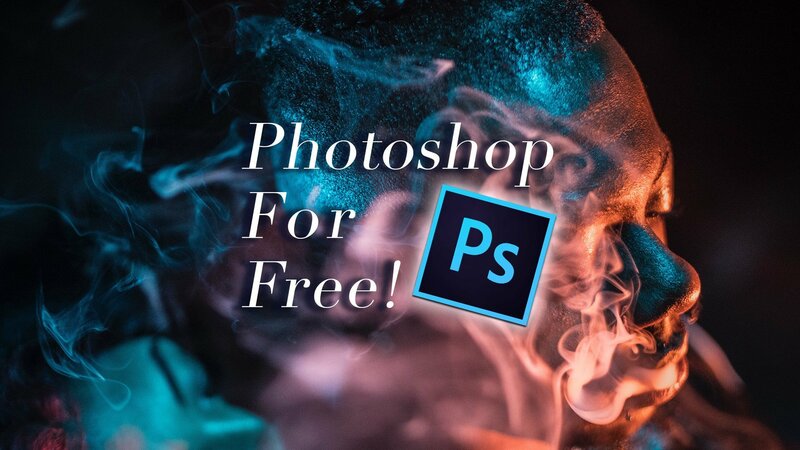 Do you still need photoshop if you can now essentially get photoshop for free online? That’s the real question. After testing both of these applications, I would say its a definite MAYBE. There are many pros to using a free version of photoshop, but also some equally strong reasons to stick with the paid software. It all depends what your personal needs are. At the end of the day, we won’t be switching away from Photoshop… yet. Since we use it almost every single day, paying $9.99/month for photoshop + lightroom is an amazing deal. But if you’re only needing to edit the odd branding template or touchup an occasional image, or just want access to photoshop tools online / from any device with an internet connection, photopea and freephototool are the two best free photoshop editing tools we’ve come across. Two thumbs straight up.